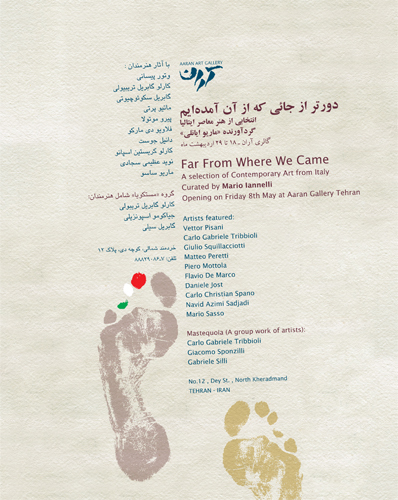 The exhibition “Far From Where We Came” brings together the energy and the skills of eleven artists of different generations based in Italy. Each artist develops an aspects of the subject through his original linguistic syntax, through different media as video, painting, sculpture, installation, ready-made and performance. “Far From Where We Came” talks about a look watching contemporarily two directions, a bifrontal look in which past and future are joined in an irreducible relationship. The following paradox finds roots in ancient traditions as well as in the contemporary art’s scene. The anciest literary poems, the Greek tragedy, and the Roman tradition give us, just to make some examples, the figures of Orpheum, Gilgames, Janus and in these characters we could find aspects that can be connected to the artistic practice. The question that we could answer today, above how much we have gone far, with the knowledge and technique, is strategically connected with the answer “from where we came”. Double-headed Janus presided at all the material and immaterial beginnings, from thresholds and archs to the beginning of the historical and mythical time, the beginning of a new enterprise, war or peace, and represented every form of passage and changing. Gilgames, two-thirds god and one-third human, departs in the search of the immortality, when upset by the death of the friend Enkidu, pushed with nobility and courage on the territory of Utnapistim called the Far. Orpheum, son of Apollo, endowed with intuitive knowledge and intime comprehension of the cicle of degeneration and regeneration of the natural world, placated, affected and persuaded with his chant Charon, Cerbero and Kore because of the love for Eurydice but when he arrived at the end of Hades, doubting she was there, he turned himself and he saw her disappearing and he lost her forever. It’s written in the Epic of Gilgames: “Before you’ll leave the desert lands Gilgames will know your arrive in his dreams”. Gilgames learned his enterprises and his destiny by the dream and he wondered what ment that clear and distorted reality. Gilgames, as Orpheum and Janus represent the prototype of the artist exploring the territories of the unconscious, the hero in the search of an unattainable goal, the form, the horizon, something always more difficult to realize, an impossible trip at the limits of the world. Going far, the supreme will of getting distances “from where we came” is the ethic principle of the hero, of whom steals the fire from the gods, the principle of the individuality. The comprehension of “where we came” pertains to a metaphysical dimension, a fixed and unchangeable reality, ineffable, whose you can only take cognizance and never live totally, but just perceive the distance, the duration. The paradox is that when we go “far” we go away “from where we came” and so the direction, the sense or the distance is established by the second term. When going far could lead to a blind alley, a labyrinth more and more complex, the aesthetic experience faces the skills of going far and emerging again. Some decisive shifts could gather the sense of the progressive changing of the time in the space as in the thought and in the imagination. “Far From Where We Came” is a paradox because the more we go “far” the more we understand that in facts we get near, in a way that is never equal to the preceding one. In the aesthetic experience is the same, we practice the ciclic and ritual contemplation of both aspects. The aesthetics as matter of interpretation of the Beauty, infact, founding its proper cognitive analysis on the experience and not on an objectivity, give us just an aspect, a splinter, not its totality. The aesthetic look watches in the distance between the “far” and “from where we came” to see its form. In the creation, as in art, the void doen’t exist. Also the void is a form. The not-being doesn’t exist. The void as total absence of form doesn’t exist. The aesthetic experience doesn’t lead to the void, the aesthetic experience is not empty. The aesthetic experience is ritual, contemplation, ciclic return. The experience of going far and the experience of the Beauty trasform and introduce to our real condition. Gilgames wanted to become like a god, but is a man. Orpheum is obliged to not turn himself back. Janus received from Saturn the gift to see both future and past. The greatest form of going far is the dream, the perfect form is to forget, but if i forget, i fall in another and bigger paradox. If i forget, doesn’t make anymore sense thinking, doesn’t make anymore sense if i have really gone far. What would happen if Gilgames forgot while he was going far. Which chant Orpheum is playing. What the faces of Janus are seeing. In Vettor Pisani’s drawings, representing obsessively a profile of a human figure and an island, the form evolving on the line of the horizon is the image of the infinite. “Miaosfinge”, a pyramid of three cans plays upon the quotation and the language, and so the “Rabbit and the philosopher’s stone”. Flavio De Marco’s “Landscapes” represent a fractal horizon, a unit in the structure of the look able to reproduce all equal landscapes. Mario Sasso’s triptych turns over the look to the top to find a new space for the imagination disappearing and emerging again in the contamination of the urban space. Piero Mottola’s “Articolazioni cromatico-emozionali vicino-lontano” are produced by a neutral and minimal impulse looking for the maximum stimulation of perceptive events in a visual structure. Matteo Peretti’s “Portraits” (“George”, “Barack”) and “Shopping”, an assemblage of plastic shoppers, evoke a second look, that one making new skins on known surfaces. Daniele Jost’s “Babels” evoke a shift in a different contest, different from the original, next as well remote, mythical and technologic. Carlo Gabriele Tribbioli’s “Paeasaggi Scheletrici” mark mental maps in the margin of objects re-emerging as abstract signs. Mastequoia’s “Strade antiche certe and idem p.” presents the documentation of the activity that the group has reconstructed, during the exploration of the itinerary of an ancient Roman connecting road, bringing back drawings, documents, notes, photos, archeological and industrial finds. Navid Azimi’s installation of a “Five-pointed star” is a metaphor of compenetration of order and disorder, life and death, and the two works on paper of the series “Rokh” and a “Cypress with skull and apples” manifest the most principal aspects of his figurative world. In Giulio Squillacciotti’s “Farfromwherewecame” (digital film 8’’), which gives the title to the exhibition, a narration is build upon imaginary facts starting from those photos and cards which complete, in the same time, the original work. On the contrary, in Carlo Spano’s “Frazioni Dinamiche” (digital film 58”), passages of real life, without a logic sequence or will of narration, just accelerated or slowed, reproduce the simulation of a cinematographic kind for the quality of the image and the duration.